We’ve got some amazing bands playing at BevFest this year. And to whet your appetites, we’ve created our own mixtape of some of them for you to enjoy. 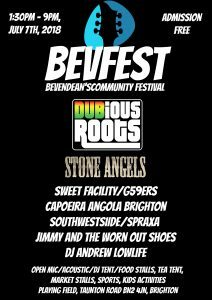 BevFest takes place on the first Saturday of July every year on the Bevendean School playing field in Bevendean. You can find out all the latest news on music, stalls, food, drink and activities on our Facebook page. Bevendean.com is the website to find out about all that is happening in Bevendean, Brighton, UK. Please bear with us while we add pages for all of the community groups and information about the area.